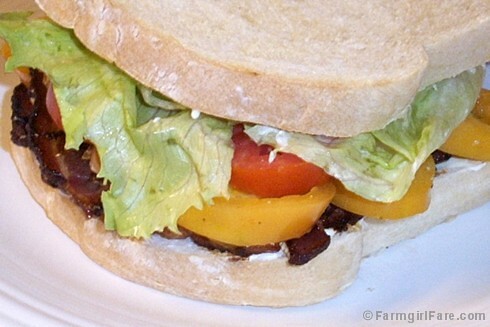 Does anything taste better than a BLT made with homegrown tomatoes on homemade bread? It's the little things often turn into the biggest celebrations here on the farm. Traditional holidays usually pass us by with little or no fanfare. That's partly because it's just the two of us, and both our families live in other states. But it's also because living on 240 acres with 100+ critters makes it nearly impossible to make and keep any sort of plans. Just getting dinner on the table at a specific time is usually a challenge. An entire roast turkey dinner in a space presentable enough for guests? Forget it. We don't even have a dining table, let alone a dining room—in the new house (which we're sort of moved into!) or The Shack. People often ask us why we never go camping. It's because living miles from the nearest neighbor in middle of nowhere is a lot like camping, complete with wild animals, beautiful scenery, and bathroom issues. Right now we're actually using a Luggable Loo. See? Camping. We really don't mind, though, and the whole lifestyle suits us. We whoop it up when we feel like it and create holidays for the silliest of reasons (Pop the cork, it's Champagne Thursday!). The opening night of BLT season each summer is always cause for celebration, and what's nice is that we get to decide when it takes place. This year it was last Friday night. Yum. This was supposed to be a short post about the blister beetles, but once I get started talking about diatomaceous earth it's hard for me to stop because it has so many great uses. Even if you're lucky enough to not know what a blister beetle is, you may still want to read on. A blister beetle sighting in the garden is always distressing. We've reached that point in the growing season where the fact that I (once again) didn't get around to planting everything I wanted to in the spring has actually turned into a good thing. As in, it's a good thing all these raised beds aren't full, or I'd be spending a lot more time standing out here in the blazing sun watering (although I am loving my new 150 feet of super lightweight Water Right garden hoses—and wish I'd bought these awesome brass quick connectors 17 years ago). Or, it's a good thing there isn't more stuff out there for the blister beetles to eat. It's a twisted way of looking at the bright side that usually works for me. The blister beetles—who seem to prefer hot, dry weather—have arrived, and they are hungry. So far I'm mostly seeing them in the pepper and tomato beds, and sometime while I wasn't paying attention during the last 48 hours, they managed to devour an entire small pepper plant and decimate several large tomato plants. And their disgusting black droppings are everywhere. 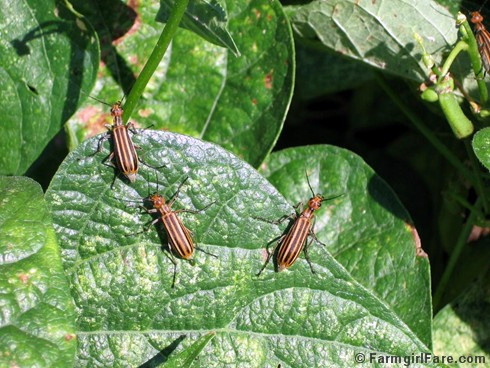 Unfortunately I'm not the only one being attacked; one of the most popular posts on In My Kitchen Garden over the past few weeks has been How To Deal with Blister Beetles in the Garden: Organic Pest Control Methods. Lots more below. . .